Bina007 Movie Reviews: CAN YOU EVER FORGIVE ME? CAN YOU EVER FORGIVE ME? is a lovely film about a rather unique story that works essentially as a two hander between its award-winning stars, Melissa McCarthy and the ever-glorious Richard E Grant. McCarthy plays one-time successful biographer Lee Israel, who has fallen out of fashion and into alcoholism and squalor. One day she chances on a genuine letter from Fanny Brice of FUNNY GIRL fame, and through small steps begins to make money by forging letters from famous writers with just the right amount of wit and salaciousness to fetch the very highest prices. To do this didn't just need a loose grasp of ethics and a facility with vintage typewriters but genuine literary taste and skill. One of the saddest moments of the film is when Lee realises that this is her most popular work in years, and it's not even in her voice. Of course, soon the collectors start to realise that her work is fake - she's "finding" too many letters, and some question whether Noel Coward would really have been so overt about his homosexual advances. The FBI contact her dealers, and she has to get her fellow alcoholic, the roguish, charming Jack Hock to fence the letters for her, making him an accomplice. What I love about this film is the genuine chemistry between McCarthy and Grant as Israel and Hock and the contrast between her misanthropy and his boyish charm and glee. Underneath both there's a story of expectations dashed and a live that hasn't lived up to their hopes - and in Hock's case in particular the sadness over fading looks, the inability to talk one's way out of travel. Both are victims of a faster, prettier world. And while aware that their schemes are wrong, don't really see the harm in it. It feels like a schoolyard jape, just like the prank calls they make. The final scene between the two has a quiet pathos - self-awareness, of mortality, crime, art. The reality of what they did and are. It's desperately moving. I also love the beautiful recreation of early 90s New York and the milieu of those bookshops that deal in first editions and collectibles. There's a certain look and indeed smell to those stores (I frequent them!) and this film somehow just captures that particularity and person. Finally, I admire the light touch, but never evasiveness, with which screenwriter Nicole Holofcener and director Marielle Heller treat Hock's dying of AIDS, and indeed both characters' homosexuality. The result is delicate, elegant, and more moving for it. 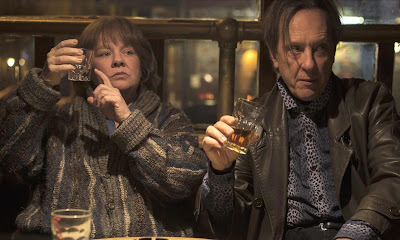 CAN YOU EVER FORGIVE ME has a running time of 106 minutes and is rated R. The film played Telluride, Toronto and London 2018. It was released last year in the USA and is currently on release in the UK.